Oh ! how I'vr beed allnred ! Oh ! God help Poor Paddy ! But I didn't care for that. And called me ragged Pat ! And they laughed at Poor Paddy, &c.
He'd show me where good work I'd find. Said I—I'll go and try. "No Irish Need Apply !" From this, teare happy land? We uobly join them in the flght. stretch forth a helping hand! And can't I put the pongelo away. And ain't she got a carroty head of hair. going down to market, as I—Chorus. And introduce Jersulem and Sal. each homey, and then we can all sing together. Poor Paddy - first line reads: If you will only list to me. 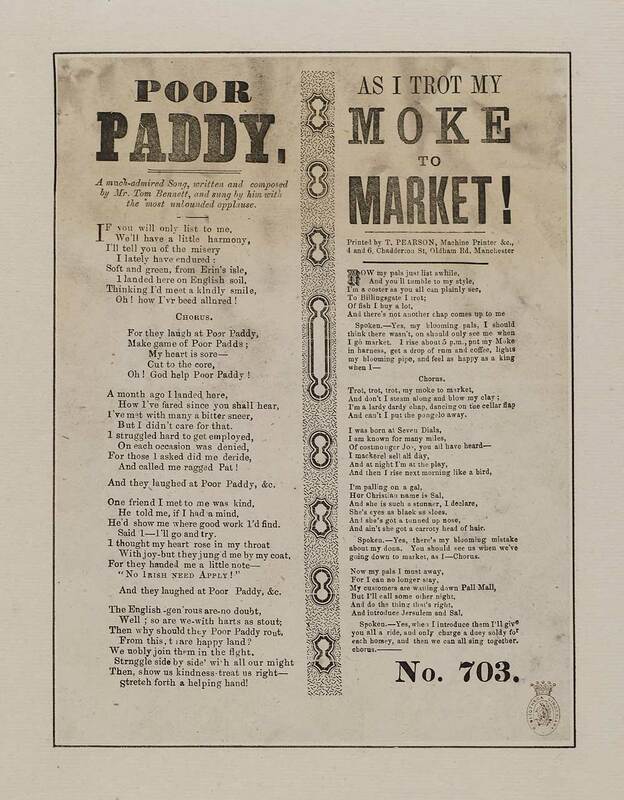 Poor Paddy - A much-admired song, written and composed by Mr. Tom Bennett, and sung by him with the most unbounded applause. As I trot my moke to market! - first line reads: Now my pals just list a while.